Months ago I was asked if I would like to review a knitting project kit by a yarn company that I had never heard of before. I took a quick peek at the company's website to see if the kits were something I would typically knit and wear, and if the yarns were my cup of tea. Right off the bat Skeino had my interest piqued. A few of the designs were very similar to the ones I had in my queue and I was immediately drawn to the gradient beauty that was the Moon Shawl. The description of the yarn used for this shawl really grabbed my attention. An I-cord yarn in which a blend of baby alpaca and merino fibres were "knitted in"? How interesting. So I emailed back with a resounding "yes!! I'm interested!!". I really had no idea what to expect and so when the package arrived in the mail I was pretty giddy with anticipation. But really, name one knitter who doesn't get excited when they receive yarn in the mail. Anyhoo, I ripped open the box and was taken away by how beautiful the yarn kit was in person. The biggest surprise of all was when I took the yarn out of the box. At first glance I was expecting the yarn to be a little dense and feel somewhat felted. Yeah, no. I couldn't believe how incredibly light and fluffy the yarn was, and how it;s actually super duper soft! So soft, that for a second there I forgot I was holding yarn and thought I was sent a cuddly kitten instead. Seriously, it's that soft. And can I point out just how gorgeously awesome the packaging of the yarn is? 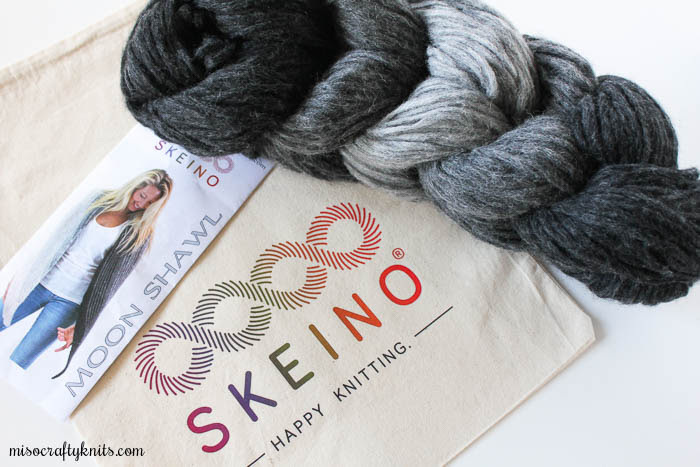 Even though the website specified that "five single skeins are braided into this knitting kit", I was still expecting to get the usual mini skeins or balls that you generally get in a kit. So I was immediately charmed when I pulled out this beautiful braided log of fluffy goodness out of the box. I'm such a sucker for great product packaging! I was so taken with the presentation of the yarn that I almost couldn't bring myself to break it apart to cast on my project. Silly, I know. I'm totally one of those people who buys a million pretty notebooks but can't bare to write in any of them for fear of "ruining" them. To make it easier on my heart myself I decided to just take one skein at a time out of the braid when I'm ready to knit with it. That way I could still appreciate the lovely gradient beauty in all its fibre-y braided glory as it sits nestled in my knitting basket. It's the little things, right? 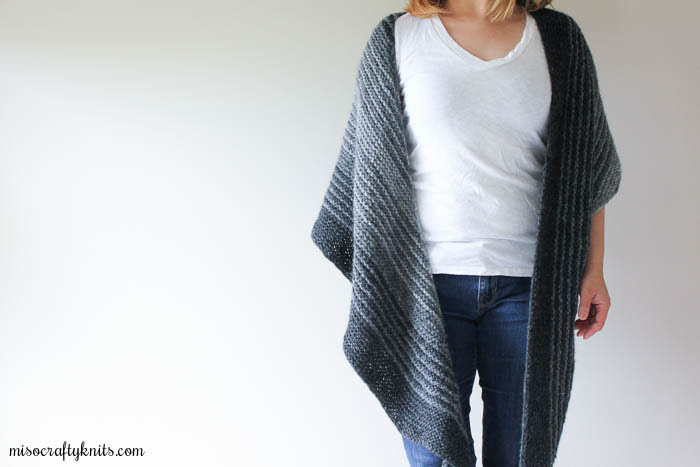 When I first expressed interest in doing a review of this kit I thought I would knit a few inches of the shawl to get a general idea of both the pattern and the yarn and then write a review. But after handling the yarn and having a really good look at it, I decided that I didn't want to rush it. I don't think I have ever knit with a yarn like this before and I really wanted to give it some proper attention. I wanted to get a full experience in knitting with it, seeing how it holds up to being manhandled, knitted, frogged, and re-knitted. To see if being shoved in and out of project bags would make it look worn before it was actually worn. And how does it wash and block? Would the yarn shed a good portion of its fibres in the water? Would touching the yarn in water make it felt? You see, my brain kept thinking this yarn was a lightly spun single ply bulky weight. When in reality it's a yarn made up of baby alpaca and fine merino (for memory) fibres knitted into a nylon I-cord centre, which makes the yarn remarkably strong for something that looks so delicate. There's no stretch to the yarn, which worried me slightly due to my tight knitting ways, but in the end it didn't matter and I found that the lack of spring to the yarn actually made me more aware of my gauge. 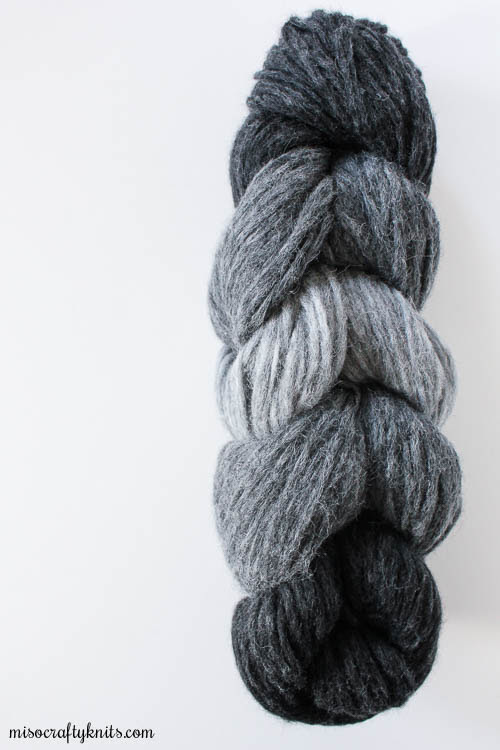 The colourways available for this yarn, both for the kit and in regular skein form, are all solids in neutral colours. For the kits, the colours are "shaded" from either light to dark or mirrored (going from dark to light and back to dark, or vice versa) to reflect the inspiration of the ever-changing moon. I had a really hard time picking out a colourway for my kit. I steered clear of the earthy colourways since I barely have anything brown or beige in my wardrobe. Although, the White-Musk colourway caught my eye, it's so lovely and I bet knitted up it would look incredibly sophisticated and elegant. But I would not wear it anyways due to the aforementioned lack of earth tones in my closet. So I narrowed my choices down to seven...then to three...then to two...then I hemmed and hawed for a day and gave up and decided to let the company choose for me. In the end I received the Dark Grey-Light Grey colourway (because you'll want to know, the other choice was White-Black). I chose to hand wind each skein as I needed them, mainly because I didn't think my ball winder could handle it. And yeah...a part of me was a little paranoid that something bad would happen. But I really didn't mind, the yarn is so fluffy soft that it was actually a pleasure to hand wind it and feel the buttery softness flow through my fingers. 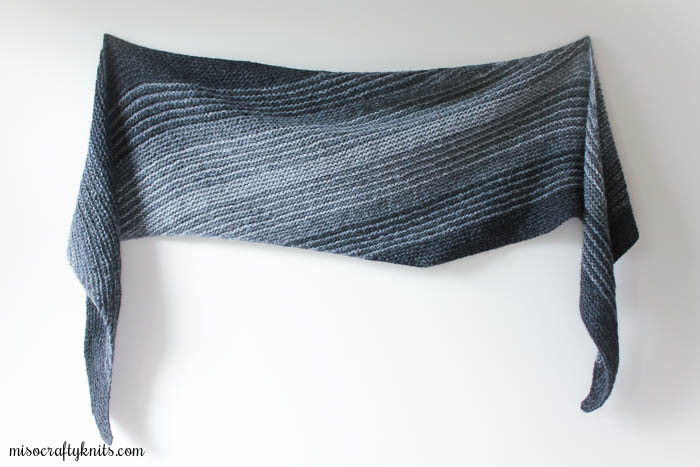 Aside from the gorgeous colourway of the sample shawl, the Moon Shawl pattern caught my eye for so many reasons: it's knitted entirely in garter, it's knitted on the bias, it has a simple shape, it looks like it has a nice enough depth to cover a good portion of your upper body, and it has a nice long wingspan. All the qualities I love in a shawl pattern and what all my past shawl projects have consisted of. So to me, picking the Moon Shawl was a complete no-brainer. 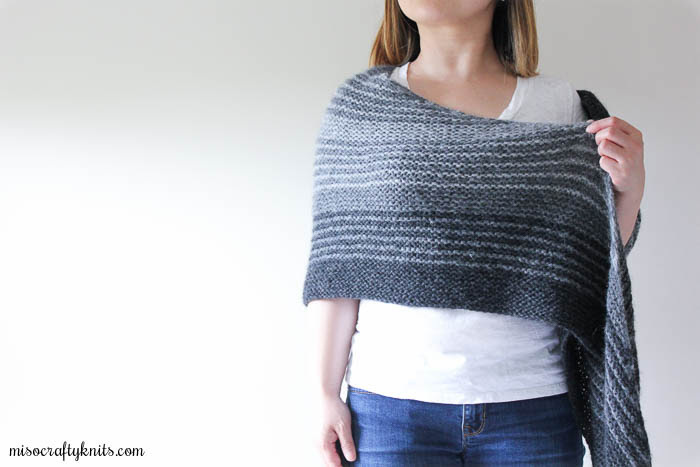 The Moon Shawl is a simple, yet elegant shawl that I can see myself wearing a lot during the cooler months, and because of the neutral colourway, would also go perfectly with everything in my wardrobe. The pattern, which is available for free on the Skeino website and on the Skeino Ravelry page, is a super easy and relaxing knit. And if your hands are in great shape (mine weren't at the time), it would be a fast knit too. I think this pattern would suit both beginners and advanced knitters alike. For beginners, as long as you know the knit stitch and can do basic increases and decreases, you've got this in the bag. For more intermediate and advanced knitters, this project would be a perfect mindless knit for social outings, Netflix marathons (or is that just me? ), and if you don't mind carrying around bigger projects, is also great for car knitting. The pattern is quite easy to memorize, and found that once I've knitted the first two sections (the solid border and then the striping into the next colour) I only had to reference the pattern once in a while just to make sure I wasn't knitting too many stripes or making the solid sections too wide. 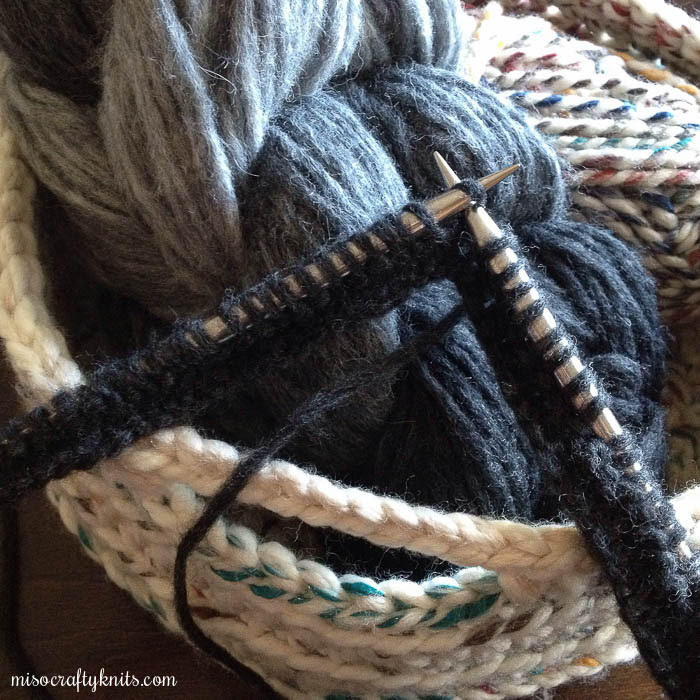 If you're knitting with your own yarns I'm pretty sure it wouldn't matter, as long as you liked the outcome, but since my yarn came in predetermined amounts I wanted to make sure I wasn't going to run out. Twice I thought I was going to run out of yarn but in the end I was fine and walked away with very tiny amounts leftover. I'm also glad that I didn't break up the braid and pre-wound each skein because I didn't have to think at all about which colour came next. I simply knitted the colour I was using, counted the garter ridges, and when it came time to incorporate the new colour I merely pulled out the skein in line. So easy peasy! After the first colour change the project started to become more like "potato chip knitting". I wanted to see what the stripes looked like, then I wanted to see how the stripes looked bordered between the two different shades of grey, then I wanted to see what the next set of stripes looked like... And the knitting was so mindless that from time to time I had to double check that I was actually doing the increases and decreases at the ends. The knitting had felt way too easy! As I had mentioned above, there's no stretch to the yarn and I thought my gauge would be extremely tight. But it all worked out and there was absolutely no issues at all. I also thought I would be splitting the yarn left and right with my super pointy needles, like I usually do with some bulky single ply yarns, but this wasn't the case. Not only would the I-cord centre make sure you didn't do that, it just simply didn't happen. This was very surprising to me considering I wasn't paying attention to my knitting half of the time. I was also surprised that my hands didn't hurt working with this yarn. I thought the lack of stretchiness would for sure cause my hands to be sore, but they were totally fine. And even though the project was bulky and grew pretty big with each colour change, the knitted fabric was surprisingly lighter than air. But don't be fooled by the featherweight fabric, this shawl is so warm thanks to the alpaca content. Because of all these elements and the softness factor, the yarn was quite enjoyable to work with. The only issues that I had with knitting with this kit, which has absolutely nothing to do with the actual pattern or yarn itself and has everything to do with me, was the fact that alpaca fibres would find its way into my already really dry eyes and from time to time I would have to pluck out a fibre from my lashes. I probably looked like a crazy person too to non-knitters. I was constantly rubbing my nose and shooing away loose fibres. And that's not to say this yarn sheds a ton. It's just like any other yarn made with alpaca. I'm just super sensitive. I also wear a lot of black, so I would often have to use a lint brush to wipe off the fibres from my clothes after a knitting session. Again, this is typical of alpaca yarns and if you're a pet-owner you probably wouldn't even notice. I had actually finished the shawl quite a while ago but got overly lazy about weaving in the ends - which actually wasn't as horrible of a task as I had made it in my mind once I had a few under my belt. The yarn was very forgiving and practically hid the ends for me. I also had to deal with the worst lighting ever. The days when the lighting was decent, were the days when I couldn't drop what I had to do that day to take an hour to take photos. Of course! Isn't that always the case though? Anyhoo, I kind of cheated when it came to soaking this bad boy. I had filled up my washing machine, added some no-rinse wool wash, and let the shawl soak in there for a while before letting the spin cycle wring out the excess water for me. But I had reasons! One, the Skeino website said that this yarn can be machine washed on the gentle cycle; and two, I should have done laundry first before blocking the shawl and so I was severely lacking the amount of towels I would have needed to squish out all that water. Speaking of water, before I had set my washing machine to the spin cycle, I swished the water around to see if there were any major colour bleeding or clumps of fibre. The water was slightly greyish (most likely due to the grime the project picked up from being worked on in numerous coffee shops and during errands in the truck) and there was a little bit of fibre floating around, but nothing more than any other yarn I've used with an alpaca content. With all that said, the shawl did grow a little bit and bloomed beautifully. That's when I realized that I didn't have any room to properly lay out the shawl to block. I stood there in the middle of my living room, freaking out with a wet lump of knitted wool in my hands. Then I remembered a recent episode of The Knit Girllls in which one of the ladies (I think it was Laura?) had mentioned she had blocked a garter stitch shawl along the edge of her ironing board. She had stretched and pinned the top edge of the shawl along the perimeter of the ironing board and had let gravity and the shawl's own weight do its thing without ruining and distorting the squishiness of the garter. So I gave it a try. Now, the shawl is actually a diamond shape but I wasn't sure how I would wear that. So I stretched it out on one side to achieve a somewhat stretched out triangular shape. The edge went completely around my ironing board and then some. But not too much, more like the tips were able to cross over each other. Then I opened my balcony door and carried on with my day. Oh...my...goodness. This method of blocking is brilliant!! Not only did this bulky weight shawl dry in record time (ok, so it's almost summer here and not the dead of winter), the integrity of the garter stitch was fully intact and not overly stretched out like I've seen in the past, the points of the shawl were gentle and not harsh (re: when you see a stitch stretched out to the max because that's where the pin would've been) - which you can see in the last photo, and best of all: I didn't have to pull out my blocking wires, I don't have a pile of towels, I only used maybe less than a dozen T-pins, and I didn't have to yell out to my family members to "watch out for the knitting on the floor!!". 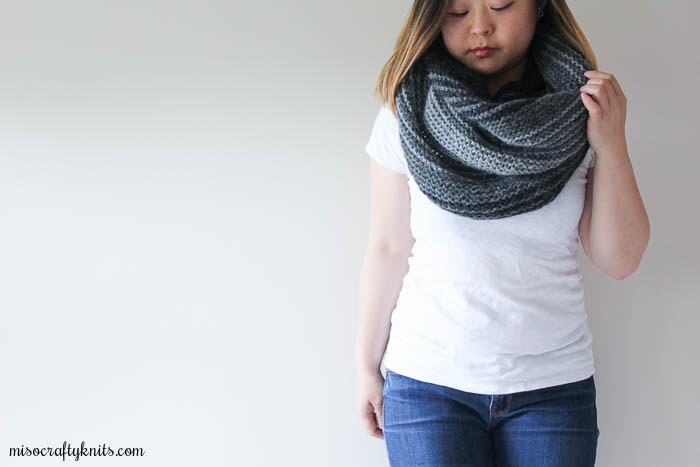 I totally want to knit another garter stitch shawl just so that I can try this blocking method again!! Brilliant!! Ok, back to the final knit. I'm really pleased and love the outcome. I thought about gifting this shawl but then took that sentiment back a day later. 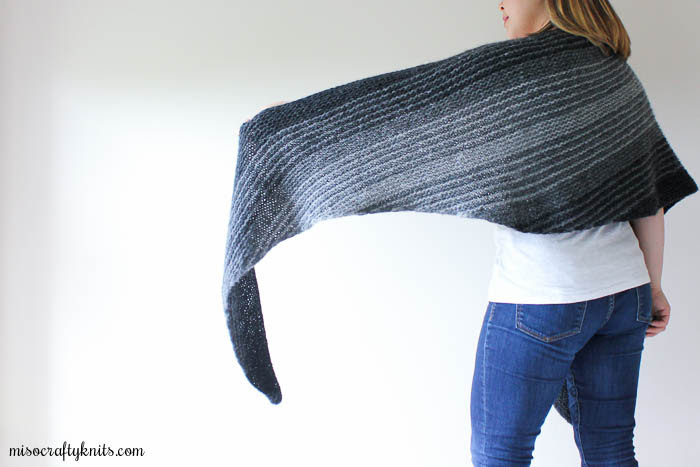 How many times have I said I wanted to knit myself a neutral, possibly black or grey, shawl that can go with pretty much everything in my closet? So.many.times. And I realized that since blocking this shawl, I've actually been using it in the evenings when the Mister and I sit out on our balcony and enjoy the end of the day. Even though we've been experiencing summer-like weather here, in the evenings where I am, it gets quite cool and at times, chilly. The shawl is so cuddly and cozy that I like to wrap it around my shoulders while I sit outside and knit and/or sip an adult beverage. Overall, I thoroughly enjoyed this knitting kit and definitely love the end product. I'm happy I was given this opportunity to try a new-to-me yarn and brand, and to try a project that I otherwise might have never stumbled upon on my own. I might have never given this yarn a second thought (or try) and most likely would've side-eyed the I-cord yarn element. So I surprised even myself to discover that I really enjoyed knitting with this yarn. If the Canadian dollar ever gets better (although, it's doing much better now than a few months ago, that's for sure! ), I would love to purchase another kit because the more I look at it, the more I want the White-Brown kit...yeah, yeah...I know, I said I have no earth tones in my wardrobe, but this is SO pretty!! And I would love to knit the Arabella Shawl in the Dogwood colourway. It's so stunning! I am not affiliated with the company mentioned in this post. I received no monetary compensation for my review. I was sent a knitting project kit for review purposes in exchange for the possibility of posting a review. The wording and opinions I've written are my own and I will not be receiving any commissions from the links provided in this post. beautiful work! I wish I had the opportunity to test knit for them. Pretty! And thanks for the blocking tip, I have an unblocked shawl tucked away because I thought I would need blocking wires, which I don't have, but maybe pinning it around the ironing board would do the trick!